The count down is on for Halloween! I waited until this week to buy our candy in hopes of not eating the majority of it (ask me how thats going so far), costumes are ready to go, and its just the right time to carve our pumpkins so that they live to see Halloween. The pumpkin carving gets a little extremely competitive in our house, so this is an activity reserved for a time when kiddies are sleeping. Layla did however choose about five pumpkins for herself, so we needed to come up with some carve-free decorating alternatives in order to use them. 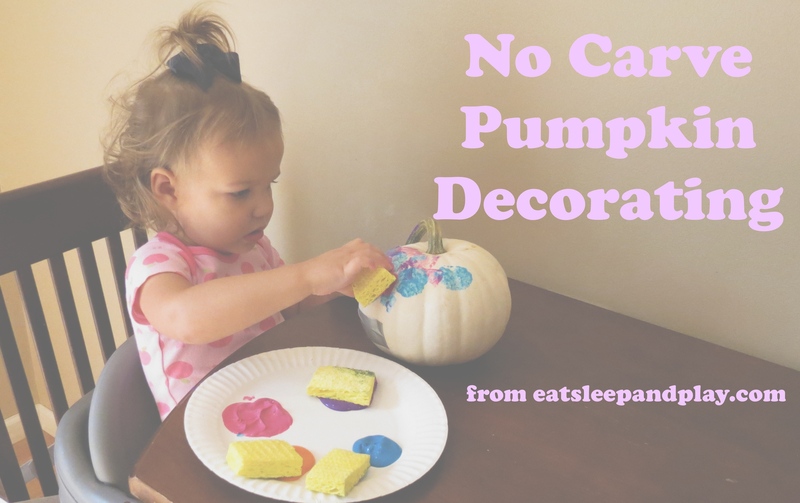 A note about painting pumpkins – I use washable paint when doing this (because as you can see by Layla’s blue mustache in the pictures, we are messy). If you are concerned about paint washing off outside try an acrylic paint – but beware this does not come out of clothes/furniture/hair (all things that were pretty nicely covered during our project) nearly as well! There are tons of adorable, fancy letter stencils you can print – but for the kids I think it’s best to keep it simple. 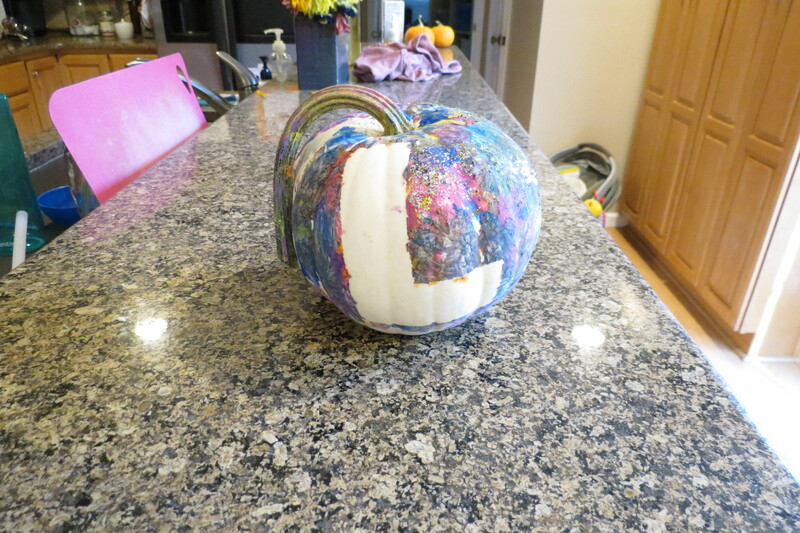 I used the tape on our pumpkin to make the letter “L”, and it peeled off great! 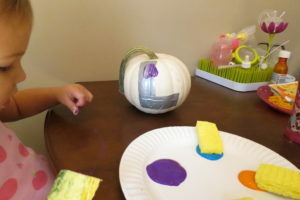 Place your tape or stencil onto the pumpkin before you begin. I found that sponge painting works best for this since more surface area gets covered (compared to using a paint brush). 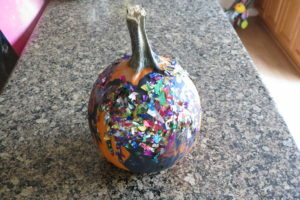 It also gives the pumpkin a fun tie-dye look. 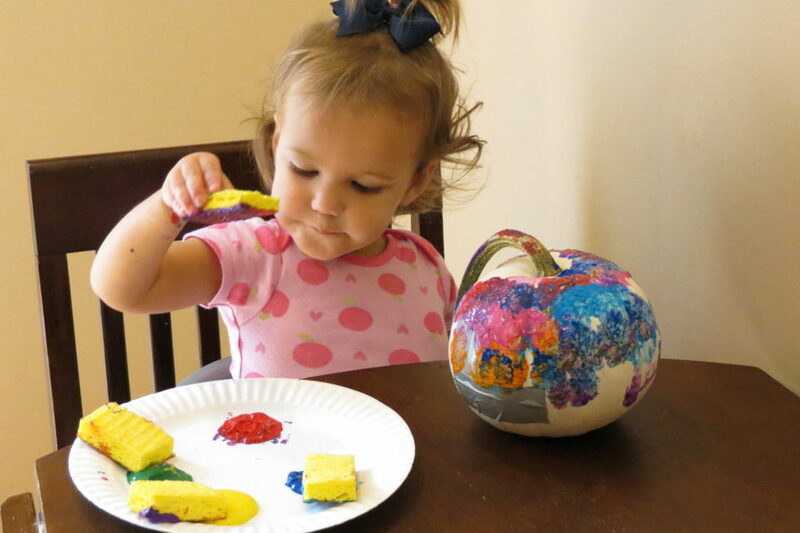 Layla dabbed her sponge all over the pumpkin, and topped with some gold glitter. After the pumpkin was completely dry, I pulled the tape off, so that the “L” was still a bright white! This would definitely work fine with an orange pumpkin, but the white gave it a great pop! You could do the same thing with a pumpkin face instead of letters! Just cover the area that you want unpainted securely with tape, and go at it! 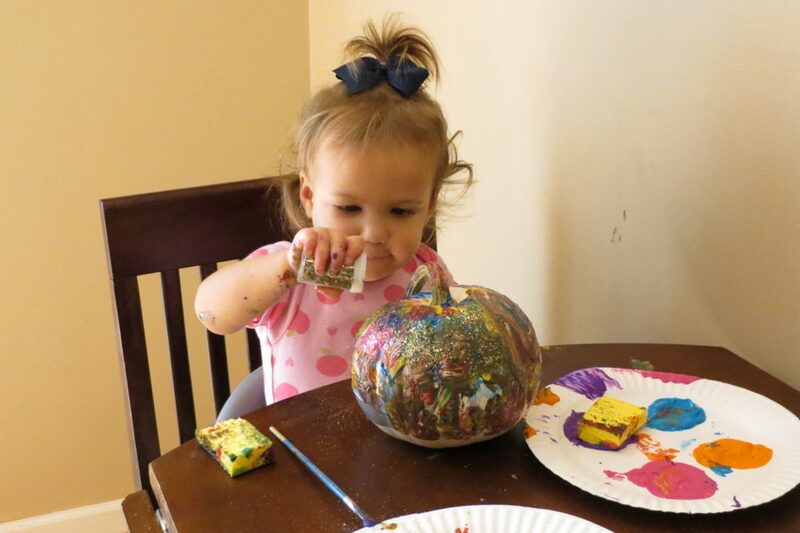 Layla actually used her pumpkin to create this during one of her art classes- and it is just adorable! Place your paint in a large cup or bowl and add a small squirt of glue (this should help the foil pieces stick slightly). Paint color doesn’t really matter for this since it will be covered for the most part. Allow your child to paint all over the pumpkin (a thicker paint brush works best), and as they go have them sprinkle pieces of the pre-cut foil over the pumpkin. This would be super cute with Halloween themed confetti like this . For smaller hands (recommended for 12-18 months) we also did some finger painting on one of our smaller pumpkins, as well as decorating one with stickers. Layla loved these simple activities just as much as the others! ← Dry Erase Book to help keep toddlers busy! I love this activity! Great blog! Thanks so much! Hope that you can use some of these activities with your kiddos!